I designed a cover to avoid scrap flying everywhere during the CNC process.The little door is used to collect scrap. Tell me if you want the STL file. I would be interested to hear from SnapMaker if this works. One has to keep in mind engineering specs and that the weight/balance this would alter to the base travel as it collects material and whether it would impact performance. I realise we are not adding weight from when the project is started, we are however redistributing the project weight, plus the weight of the dust cover surround. Still, this is a clever idea, well done. I am waiting to see if someone builds a surround case to capture vent vapors from the laser etching and 3D printing. If not I might have a go when I receive my Snapmaker… some of us are sensitive nose types. I’d like that STL file. I strongly suspect it’ll be very useful. Well done, sir. A cover to avoid scrap flying everywhere during the CNC process.The little door is used to collect scrap. Well done! we just talked about it last week and you have made it this week! Some other friends are asking this problem, I will give them your design. I’m thinking of designing my own mount for my vacuum cleaner. Then make a triple-mount for 3 smaller hoses and then smaller attachments/holes to the shield like Darren made, dust and the smallest pieces would go directly to the sides where you can easily remove the dust and bigger parts + other parts would take less time and easier to clean ! We will collect the useful accessories in our thingiverse account so that the following users could find it and enjoy. I am having issues with the link. I get a 404. I wonder if CNC chips have any static charge…? Hi, the previous page is created by one of our users, it may be deleted now. Remember to click the “Thing Files” in the tapbar below, since the DOWNLOAD ALL FILES button doesn’t work sometimes. A note for other newbies. This is my second ever 3D printing project. 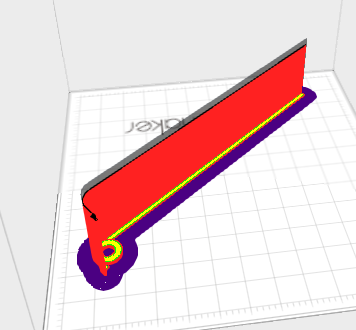 When I loaded it in the Snapmaker3D application, the software said that the project went outside the build area due to the extra length added from the raft base. The project was loaded from side to side in the build area. So I moved the project to be diagonal , problem solved. I am currently printing the first fence as a fast print and it looks great. Update 1: after printing, when I tried to separate fence from raft, it split. Now reprinting with Normal Quality to see how that goes… we live and learn. Update 3: All finished, fro newbies like me be careful when snapping of the gate support, I actually broke the fence to the side of the gate. @doug thanks for the tips. Maybe one of these days when I run out of things to print i’ll try the CNC module. What’s a good “thing” to try first? It may be a race to who uses the CNC first, I have not tried it as yet. I will share my adventure when I succeed or fail. Hopefully others will also share there experiences.